Actress Rebel Wilson was joint by her Night at the Museum 3 co-star on the red carpet of the New York City premiere on December 11th. We love how casual this is. It would make a killer rap album cover. Actress Sarah Jessica Parker escorted her two daughters Tabitha and Marion to school in New York City on December 11th. We’ve loved watching these two develop a pretty rad fashion sense just like their mama. The world better watch out for these future fashionistas! Singers Jessie J and Ariana Grande hit the stage at Q102’s 2014 Jingle Ball in Philadelphia on December 10th. The two joint up to sing their mega hit Bang Bang and it was amazing as usual. Actress Jessica Alba showed off her healthy side as she left Whole Foods in Los Angeles, California on December 10th. She looked pretty stoked to indulge in that green smoothie. We should probably jump on this bandwagon but let’s be honest, it’s so hard to say no to milkshakes. 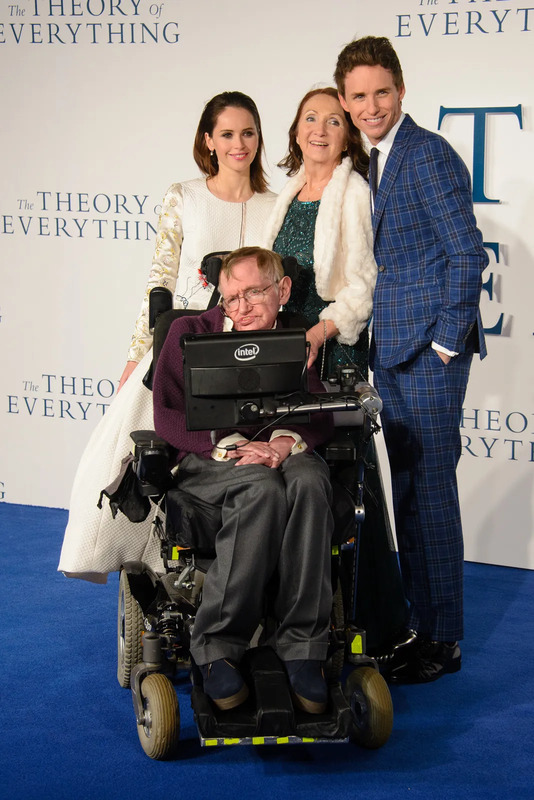 Actors Eddie Redmayne and Felicity Jones posed for photos with famed physicist Stephen Hawking and his former wife Jane on December 9th, at the London premiere of The Theory of Everything. It must've been such a relief knowing their performances have been given high praise by the Hawkings. Actresses Jessica Alba and Jaime King hung out while their children had a playdate in Los Angeles, California on December 8th. We kind of love when celebs are best friends and set their kids up with each other. Why weren’t we invited to hang with them?! 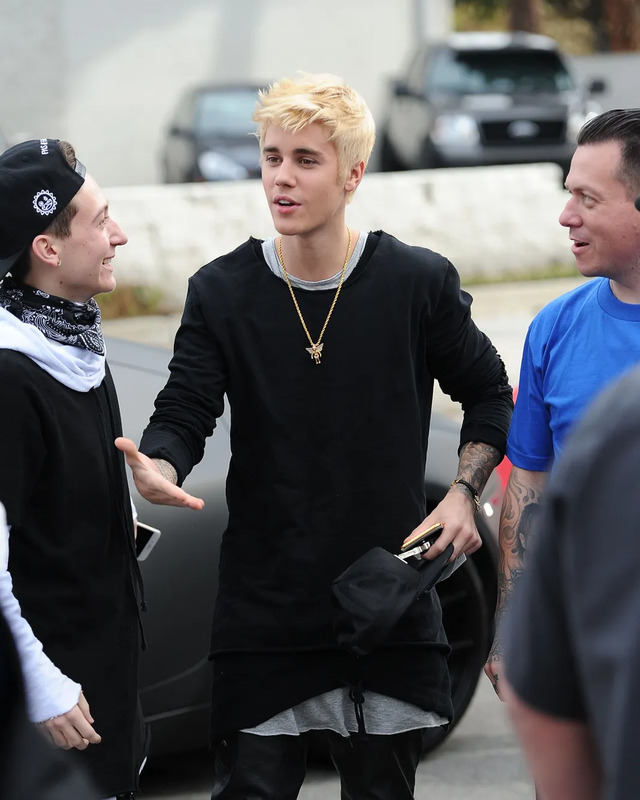 Singer Justin Bieber showed off his new platinum locks at West Coast Custom in Los Angeles, California on December 7th. We’re pretty into it... is that weird? I mean, it really doesn’t look that bad. Who would of thought the Biebz could pull this look off! Oscar-nominated actress (feel unaccomplished yet?) Quvenzhané Wallis lit up the red carpet at the premiere of her new movie Annie in New York on December 7th. This time, the 11-year-old fashionista traded her puppy purses for a real live pooch, posing with the adorable dog that plays Sandy in the film. So it seems that what Quvenzhané is hinting at is that you’re never fully dressed without some variation of a dog by your side. Just another reason to go out and adopt! 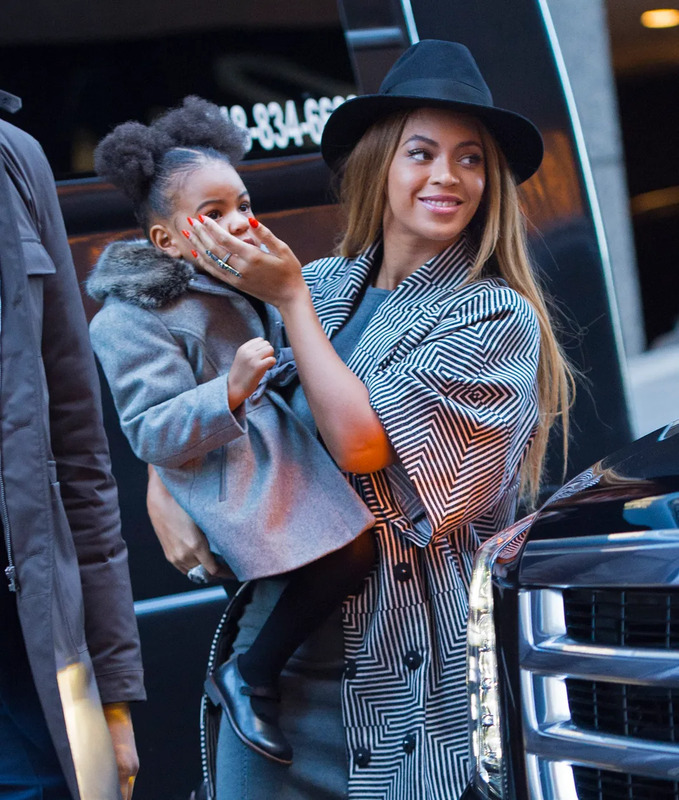 Singer Beyoncé Knowles carried daughter Blue Ivy Carter into the premiere of Annie at the Ziegfeld Theater in New York City on December 7th. We dream of the day when Beyonce gently caresses our face like this. That is one lucky baby. 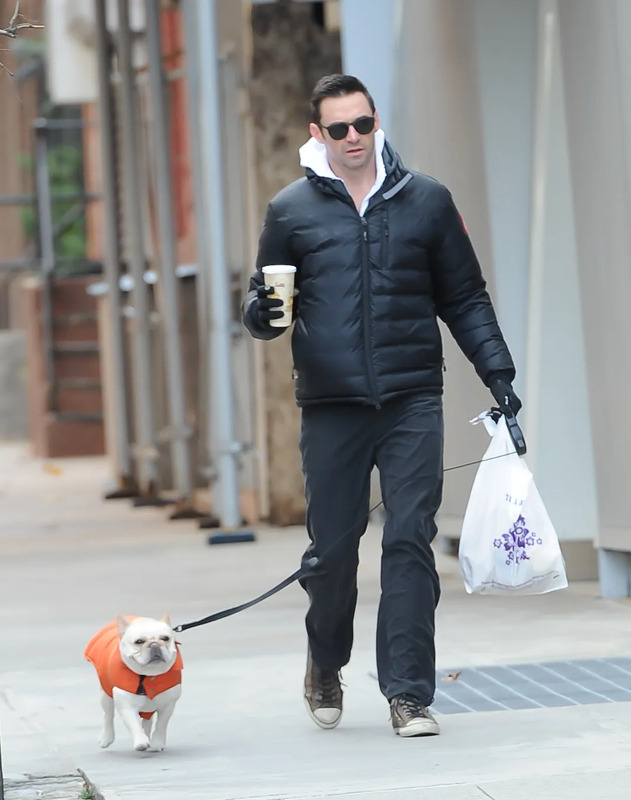 Actor Hugh Jackman went on a casual walk for food and coffee with his dog Dali on December 7th in New York City. We may have been obsessed with this dog since the first time we saw him. This Frenchie totally knows how cool his owner is, just look at that grin! Singer Charli XCX posed backstage at KIIS FM’s 2014 Jingle Ball in Los Angeles, California on December 7th. As cute as this is, the bunny is a few months early for this sort of appearance. Let’s get through December and then start thinking of Spring! Actor Adrian Grenier splashed around with some friends in Miami Beach on December 6th. We wish he would just stay in the water with his hair pushed back and that really cute expression on his face for a little while longer. We're on our way! 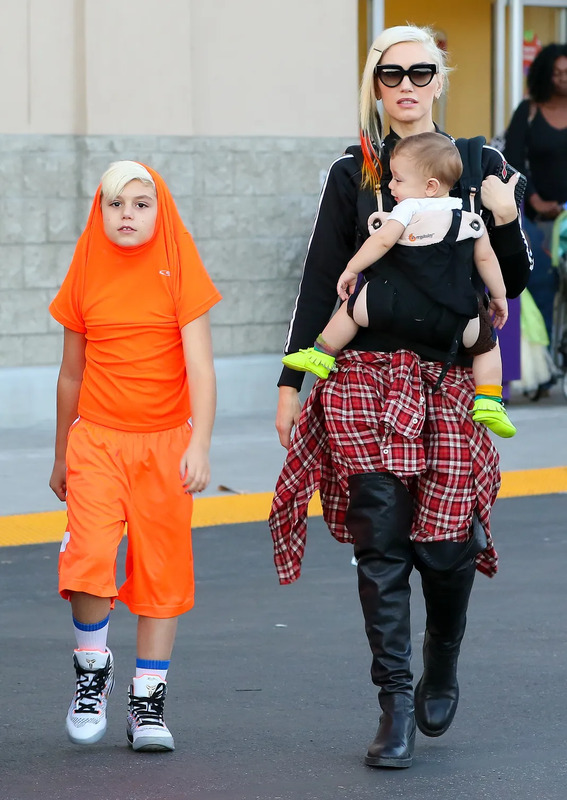 Singer Gwen Stefani (and her clearly awesome son Kingston) shopped at Toys R Us in Los Angeles, California on December 6th. Newcomer to the Rossdale gang, Apollo, joined in on the action also. We are pretty jealous that he has a big brother like Kingston to show him the ropes on how to pose properly for the paparazzi. 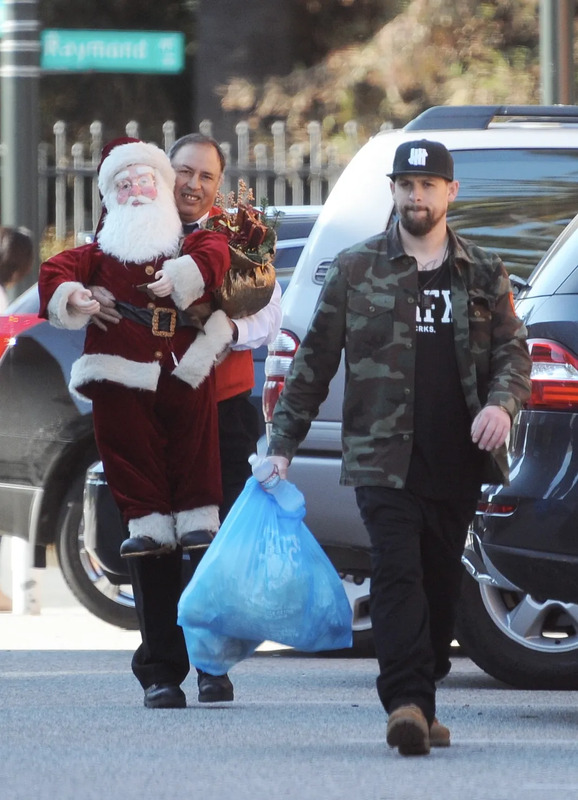 Singer Joel Madden picked up some Christmas decorations in Pasadena, California on December 6th. While making his way out, he was helped by the most joyous man. This guy loves his job so much and the fact that he’s carrying a huge Santa make this photo our favorite. Singers Ariana Grande and Big Sean brought the heat at KIIS FM’s 2014 Jingle Ball at the Staples Center in Los Angeles on December 5th. Sparks were flying when they brought their budding romance into the limelight for a PDA-filled performance of her hit song, “Best Mistake.” We love how in love they are! And they may sing the song together, but this pairing is certainly no mistake. Singer Miley Cyrus and new boyfriend Patrick Schwarzenegger were spotted cuddling while out with friends in Miami, Florida on December 5th. Words can’t express how much we approve of this relationship! TV reality personalities Kourtney Kardashian and boyfriend/babies daddy Scott Disick grabbed a bite to eat in Los Angeles, California on December 5th. Already the parents of two, Kourt and Scott will soon be welcoming #3 into the Kardash clan, and we are so stoked. 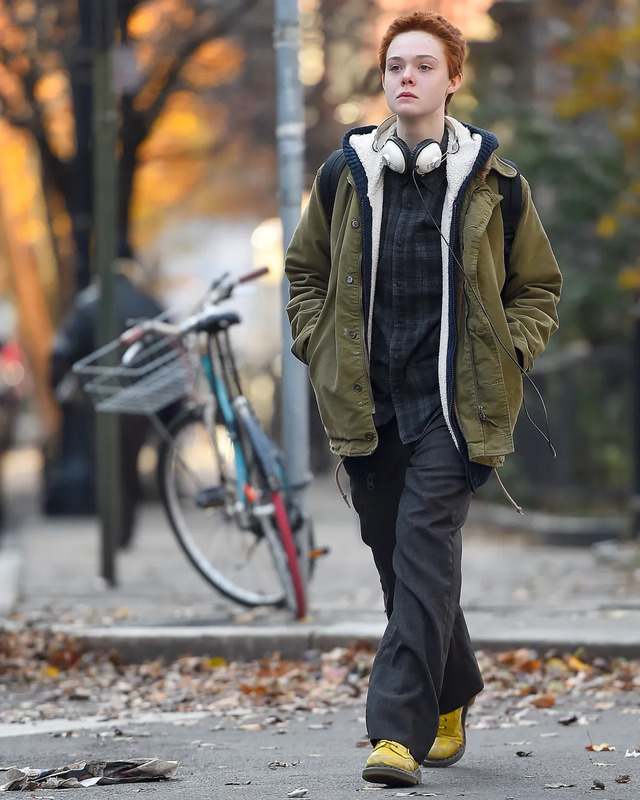 Actress Elle Fanning was spotted sporting an entirely new look on the set of her upcoming movie Three Generations in New York City on December 4th. Talk about major transformations for movie roles! We almost didn’t recognize that this was Aurora. Actors Ansel Elgort and Shailene Woodley met up at the GQ Men of the Year Party in Los Angeles on December 4th. We’re still finding tissues around our home from the first (and second, and third, and fourth…) time we violently sobbed from watching the pair in The Fault in Our Stars. We think it’ll be at least another few years before we can see them together and not want to hug them without ever letting go. Actress Angelina Jolie comforted a crying fan outside the John Stewart show in New York City on December 4th. This just proves once again why she is one of our Hollywood favorites. Actress Vanessa Hudgens spent the afternoon of December 4th shopping for a new pair of sunglasses at Shole in Los Angeles. With the sunnies, her new fringed do, and those flowy pinstriped pants, she looked like a mod hippy princess and we love, love, love it! Actress Blake Lively showed off her growing baby bump as she left her New York City hotel on December 4th. Not to mention, that doorman behind her is super enthusiastic about his job and we are loving it. 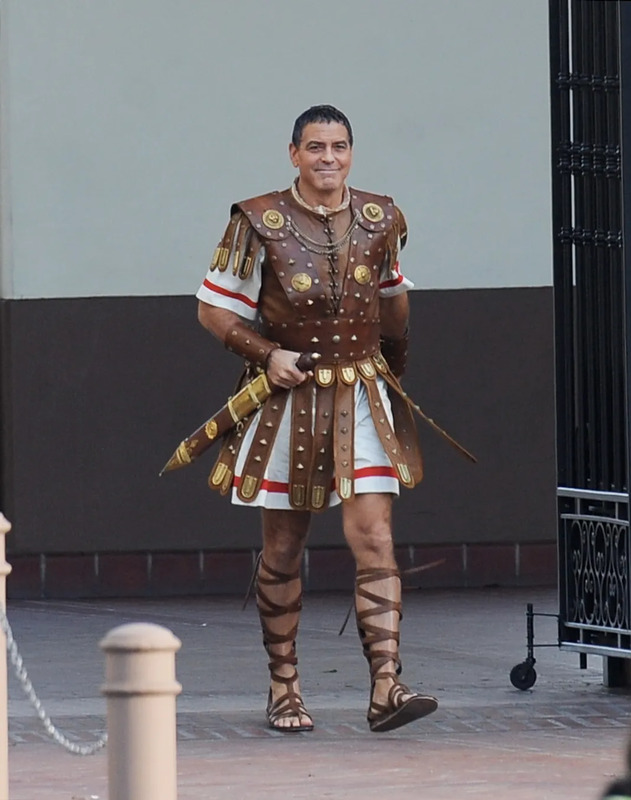 Actor George Clooney was spotted filming his upcoming movie,Hail Caesar, in downtown Los Angeles, California on December 4th. He's rocking a killer outfit.. those are some pretty fashionable sandals. We wonder if Amal is into this new look. Singer and musical God Pharrell Williams finally got his star on the Hollywood Walk of Fame in California on December 4th. Why this didn’t happen years ago is something we will always wonder. Proud of you Pharrell! 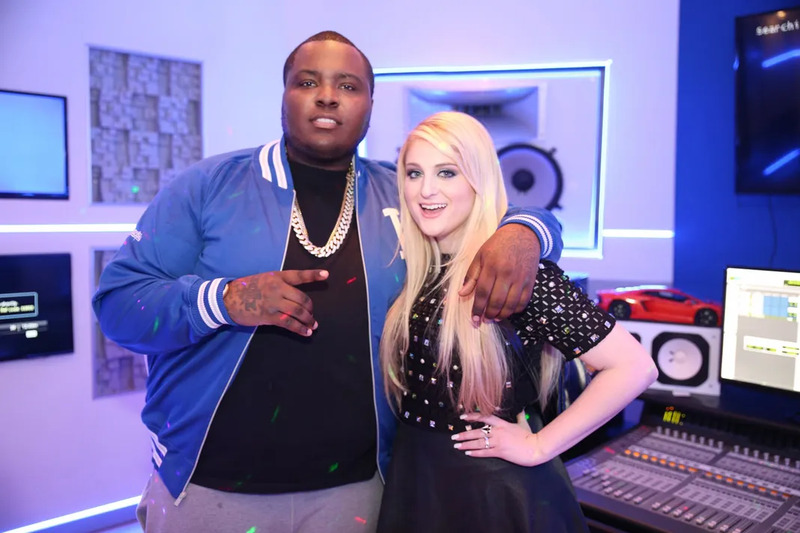 Singer Meghan Trainor and Sean Kingston hit the studio together in Los Angeles, California on December 3rd. We’ve been wondering where he’s been lately, and with a partner like Meghan, we know this upcoming song will be our next major obsession. Singer Ariana Grande almost got knocked out while she performed at the 2014 Victoria’s Secret Fashion Show on December 2nd in London. No matter how many times we see this photo, it is just as amazing and hilarious as the first time we saw it. Singer Taylor Swift walked alongside her real life BFF, model Karlie Kloss, as she performed on the 2014 Victoria’s Secret Fashion Show in London on December 2nd. It’s almost hard to tell which one is the Model. Hey Tay, we expect to see you in wings next year. Rapper Iggy Azalea was spotted on December 2nd leaving Dr. Tattoff, a tattoo removal clinic in Beverly Hills. Iggy had a band-aid on her left pinky where she had previously inked the name of former flame, A$AP Rocky, making it a pretty safe bet that she’s moving on from her ex once and for all. We can’t imagine that it was the most comfortable process though. Talk about a painful breakup! 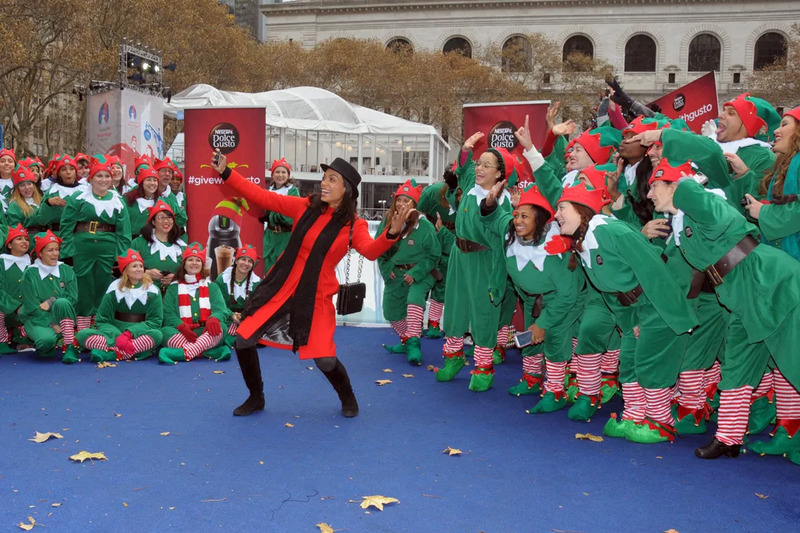 The Top Five actress, Rosario Dawson, snapped a photo with 100 elves in New York City on December 2nd. She was celebrating the launch of the Give With Gusto campaign with NESCAFE Dolce Gusto. Let’s see Ellen DeGeneres try and top this one! 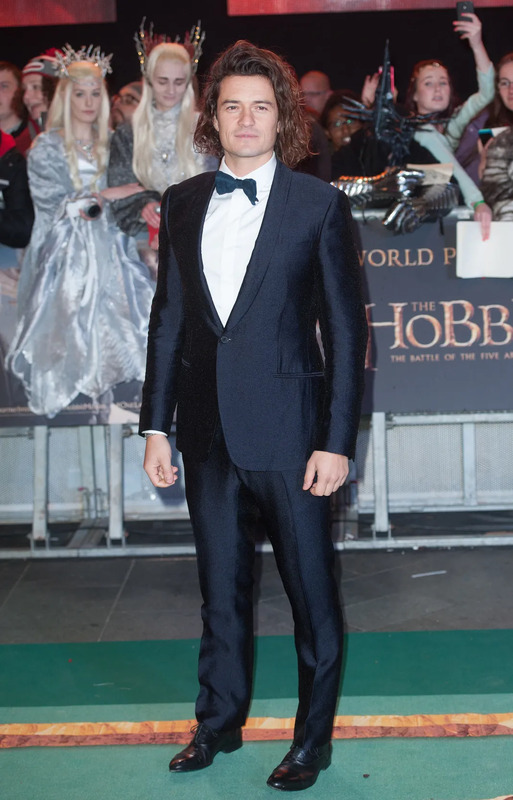 Actor Orlando Bloom walked the red carpet at the world premiere of his new film The Hobbit: The Battle of the Five Armies in London on December 1st. He was amongst some very elaborately costumed fans who may or may not realize they’re not at a casting call. What we’ve realized though, is that if Orlando ever decides to quit acting he has plenty of options to fall back on, most obvious being: hair model, man on the cover of romance novels, or our boyfriend. We’re rooting for the last one. Punk rock legend Courtney Love walked hand-in-hand with singer Lana Del Rey at the 2014 British Fashion Awards held at The London Coliseum on December 1st.To the delight of every indie flower child who’s heart still lies in the 90s, Courtney will be joining Lana for eight stops on her “Endless Summer” North American tour. Oh how we wish we could be a fly on the wall of the hotel rooms they’ll be partying in. Singer John Legend and his model wife Chrissy Teigen ran through the streets of New York City on December 1st. We appreciate that John looks a little out of breath, but that’s about as close to capturing reality as this picture gets. Give John some major forehead sweat, put some coffee stains on Chrissy’s shirt, add a giant puddle under her feet, and trade the dog for a bag of Chipotle take-out, and then you’ll start to get the sense of what someone running through the streets of NYC really looks like.